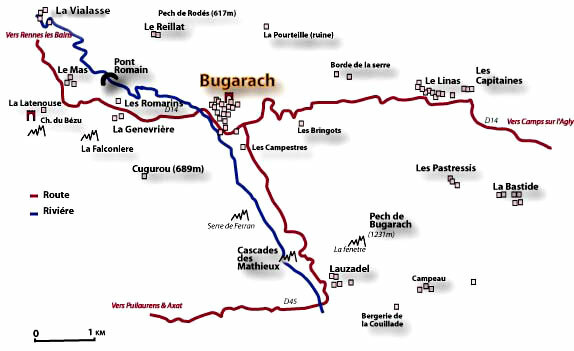 Pech de Thauze is better known as Bugarach – the name of the village that sits at the bottom of its slopes. 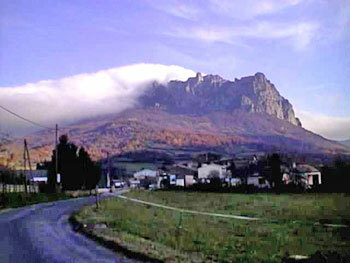 Bugarach is an impressive mountain, which has always spoken to the imagination of the local people. But today, its mystery has been eclipsed by another village, that of Rennes-le-Château, which in distance is close, but in interest, has attracted most of the attention. 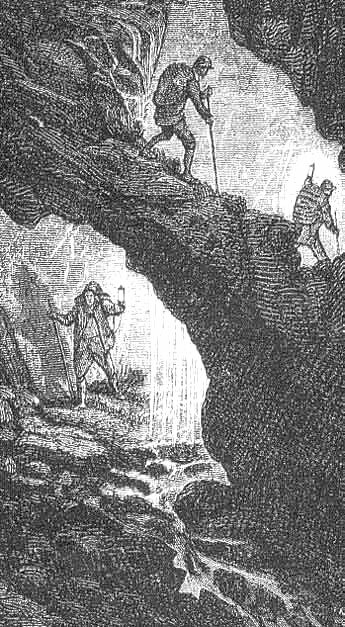 Still, Bugarach has its own mystery, specifically the mysterious adventures of one Daniel Bettex, who came to the site, went on underground expeditions… and eventually lost his life in these endeavours. The entire region is limestone, and hence there are numerous caves. Bugarach has its fair share of underground caverns, some of which are unknown to the general public, some of which are known to certain “initiates” and some which have perhaps never been discovered. It is an area with large underground salt deposits, specifically in the neighbouring Rennes-les-Bains, whereas Rennes-le-Château is often said to have a large underground water tank, which might go as deep as several hundreds of meters. The underground network is complex, largely unexplored, and runs for miles. It is known that an underground river near Bugarach is connected as far west as Salses… no doubt before entering into the Mediterranean basin. The river does not appear on any maps, but underneath the surface, it runs its course. The tradition of entrances giving way to large subterranean networks sits within the pagan Celtic religion, in which hollow hills were deemed to be entrances to “other worlds”, specifically the realm of the fairies. These hills were not really hollow – but that is what they were labelled; other traditions described them as crystal or glass-like. We can only wonder about the similarity between BoGogoRCH and BuGaRaCH (the capitalization is taken from the work of Michel Lamy). The famous underground world with its divine, otherworldly ruler exists in legend, where he ruled over a people that were sheltered from the piercing eyes of Mankind. The notion may seem strange, but the Fortean literature – and comic books such as Yoko Tsuno – is replete with stories of strange, otherworldly and/or alien civilizations hiding underneath the Earth’s surface. Some have even spun theories suggesting that the Earth itself is hollow – that this “fact” is known to a select few and thus part of a major conspiracy… and that this hollow earth would even be a hiding place for the Fourth Reich – surviving Nazis from World War II. It is part of the mystic lore of Bulwer-Lytton in The Coming Race, in which these subterranean people use a mysterious power source, “vril”, which will one day leave its obscure hidings and enter into the light – making us into their slave race. Verne drew the reader’s attention towards Bugarach, using many of the toponyms in the area in his novels. There is the reference to a “Clovis Dardentor”, which has been explained as being of interest to the mystery of Rennes-le-Château. In this novel, the hero seeks a fabulous treasure which he can find only by using geographical data and a select few documents. Alas, the deposit is impossible to locate – very much like Saunière’s. Verne was not the only author with such an interest. There is Maurice Leblanc, Gaston Leroux, George Sand, Andre Malraux, Louis Fédié, Henri Boudet, Daniel Réju, Serge Hutin, Luc Alberny, to quote only those. It is a long list, but when one looks beneath the surface, it becomes clear that these authors belonged to various initiatory organisations, some obscure, others better known. But in all cases, the references are few and far between. Though clear works of fiction, they are nevertheless clearly “manmade”, written by a human being, conscious of what he is writing. Can it therefore be really a coincidence? Instead, is it certain knowledge that these authors are able to pass into the public conscience, who is unaware of it, and even those who are looking will never be able to say more than observe “the coincidence”, which is all that we can do here… but is it not like the magician, who is sworn to secrecy not to reveal his act, but who can nevertheless hint and point at the mechanism of his profession… so that those who are observant, will see and learn? The death of the Daniel Bettex, in, on or under Bugarach, has become a local legend. Outside of France, it is known of, but details of the events are often scant or missing from the accounts. As such, it is largely unreported. Bettex was one of those who, since 1960, were attracted to the mountain and carried out curious investigations. Various prospections of the area were carried out, often discreetly. Often, these expeditions led to rumours, sometimes to entire fabrications. In some cases, a written report was produced, but that did not mean there was no room for amazement or further questions. Some left behind sufficient evidence that opened up even more questions, though in all these cases, a clear revelation was never on the cards. Most of the routes of these stories take us back to the Cathars, even though it is the story of Daniel Bettex, a Swiss citizen who was a security officer at Geneva airport. Bettex contacted the Cathar organization that had been founded by Déodat Roché. In his correspondence with the organisation, he enquired about places where he could begin his research. He desired remote locations, so that he was left undisturbed. 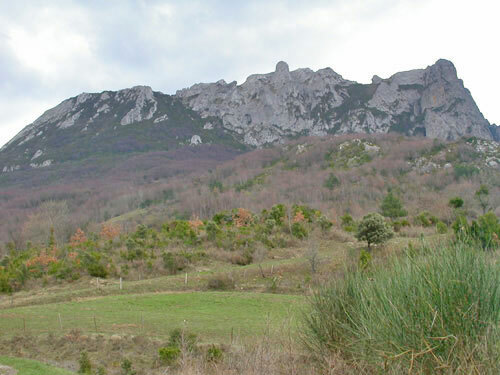 Roché thus advised him to study the sector of Bugarach, which had been little prospected by other members of his organization, even though it was known that the Cathars referred to the mountain. To this end, Roché also recommended to Bettex that he contacted Lucienne Julien, then secretary-general of the organisation. The latter kept up a close correspondence with Bettex, specifically as he progressed in his Bugarach research. We learned the details of Bettex’s adventures through her. Bettex’s research progressed, filing through files while he was in Switzerland, and on the ground when he descended to the South of France during his holidays. Initially, he studied the old registers that existed on the area, which had details of mining activities and contained information on the underground resources of the local and surrounding community. Bettex was grateful to Julien, as her local standing opened many public and private archives, which she apparently opened and gratefully shared with Bettex. 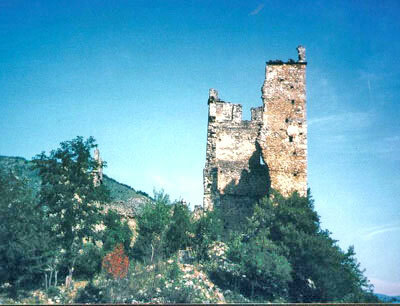 The castle of Miglos is believed by some to be an entrance to the "Other World"
They uncovered a work on the mythology attached to the mountain, written by a university student during the war. Its author had been called up for military service, finding a heroic but early end during one of the attacks of the German troops. The thesis had several legends and myths, all about the sector that the two researchers were interested in. Some of the legends went back as early as the 15th century. True, such a compendium is not an archaeological report. The legends speak of hollow ground, Agartha and traditions of an underground grid, made of natural or man-made tunnels. The story of Atlantis is never far removed from these and various legends speak of installations, either under the ocean or the land, in which certain Atlanteans were able to survive the cataclysm that was said to have ended their civilisation. At the bottom of forgotten cavities, sometimes flooded, whole or part of the secrets of this legendary civilisation were said to exist. There are many accounts of accesses to this underground empire. One finds these legends in French provinces like the High Loire (Pradelles), Ariège (Miglos), the Pilat (Annonay), the Ardeche (St Pierreville) the Maritime Alps (Falicon), Provence (the plate of Clansaye, Baux of Provence), etc., to only quote the best known. Though details and aspects may differ, in essence, each story follows the same structure. Normally, it is an animal or a small child that falls in the opening and is found again, sometimes days later, in perfect health. But if this befalls children, it turns out they have no memory of their adventure. Sometimes, the missing person is an adult – a hunter, a shepherd, a poacher and in one case even a magistrate – who is discovered after a missing period of time. His beard has grown, but he has no memory of what happened to him. Two accounts speak of two men who had undergone this trial, returning with entirely bleached hair! Also, the people who stumbled into the darkness of the underground were never equipped with lighting, but somehow managed to move in this darkness, even being able to find an exit. Sometimes, the entrance is said to be guarded by a creature; sometimes, it is said that there are phenomenal treasures about… finally, there is often a story present of a gigantic underground lake, or of major rivers feeding them. But it seems that they are possible to be traversed, even to follow them, without knowing where they might go.